Thinking about a corporate chair massage program for your office or company? Consider the benefits to employees and your company. Whether you provide massage regularly, just during “crunch” times, or as an employee appreciation treat, massage can really make a difference in productivity, job satisfaction, and health. Best plan for low stress environment on a budget. Once per month our massage therapist/s set up massage chair/s in a room at your location. Any needed supplies will be brought by our therapist. Hourly rate is $80 per hour per therapist , minimum of 2 hours. Moderate level of stress in office can greatly reduce the productivity of you staff. 2 chair massages per month can not only reduce tension but reduce likelihood of injuries caused by repetitive motions or poor body posture. Our massage therapist/s set up massage chair/s in a room at your location. Any needed supplies will be brought by our therapist. Hourly rate is $75 per hour per therapist, minimum of 2 hours. High stress levels in the office can greatly reduce not only the productivity of you staff but their health as well. 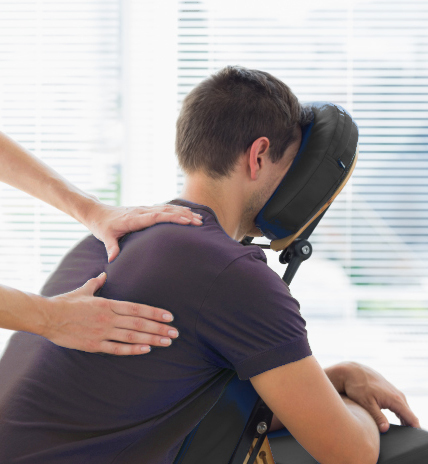 A chair massage per week can not only reduce tension but reduce likelihood of stress related injuries and ailments. Our massage therapist/s set up massage chair/s in a room at your location. Any needed supplies will be brought by our therapist. Hourly rate is $70 per hour per therapist, minimum of 2 hours. Not sure which would be best for you? We suggest booking a session and judge the feedback from your staff. The first chair massage session is only $50 per hour.